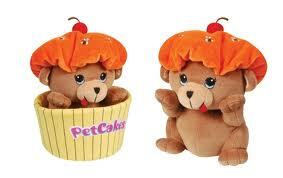 PetCakes is a new collectable plush pet set that will be a sweet treat for children for about ages 3 & Up. 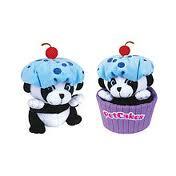 Each Petcakes animal features a frosting hat and comes in it's own cupcake wrapper and has it's own backstory. When kids first look at this their going to see this yummy cupcake but then will be surprised by the pet they find inside. A combining of sweet faces and cuddly plush with a cleaver cupcake theme. 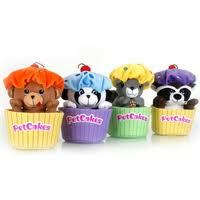 PetCakes are a collectable and provide hours of entertainment for kids. Petcakes make special gifts for friends or pet lovers everywhere. Their great for Birthday Party Favors, Stocking Stuffers, and can even be used for rewards for good grades. Come and collect them all. The ones I were sent for review are the Bamboo Berry and Honey Bear I have to tell you these are so adorable I'm tempted to keep them for myself and get the other 2 to put in my room instead of my daughter's but she loves them so their her's. Creator Fred Catapano started in 1966 with a 1,000 loan two sewing machines and a passion for creating soft playthings by 1968 Well Made Toy Manufacturing Corporation was in business and Catapano was actively involved in the making and production of plush toys and rag dolls.When petcakes are pressed down into the wrapper they look like a cupcake. Honey Cakes is the Honey Bear that lives in the honey suckle woods he looks for bee hives and then makes friends with the bees. They let him taste his delicious honey he spreads it on his cakes, bread and put scoops of it in his tea. Bamboo Berry is the panda that lives in the woods he lives in a bamboo patch of Honey Suckle. It's quiet and peaceful there he eats tender fresh bamboo shoots and for desert he dreams of vanilla cupcakes with berry frosting. Here is where to purchase PetCakes. Want to win a Petcake of your own?? Follow the Rafflecopter Below to Enter! You will win 1 Petcake from series 2 that they would choose. "Honey Cakes" is very cute. My daughter would love him. I couldn't find your G+ info...so I follow through GFC (amdierm). Lemme know how to G+ you and I'll do! Love Bamboo Berry! I love the cute little Panda. Honey Cakes is adorable...hard to choose!